We have WIFI - kinda - at the cabin in Joshua Tree, but we got nothing at the house in Wonder Valley. We missed it for a minute. Screens don't matter as much when you have spectacles like this out your front door. 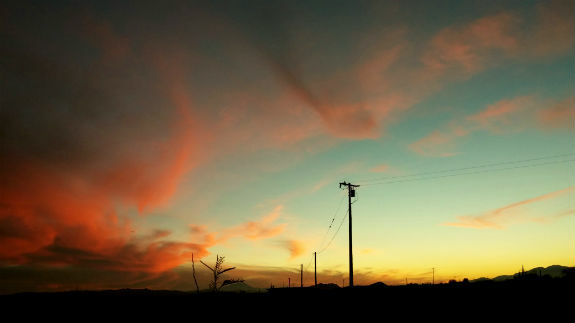 But once the sun sets there are fewer distractions and I've found myself longing for a movie. 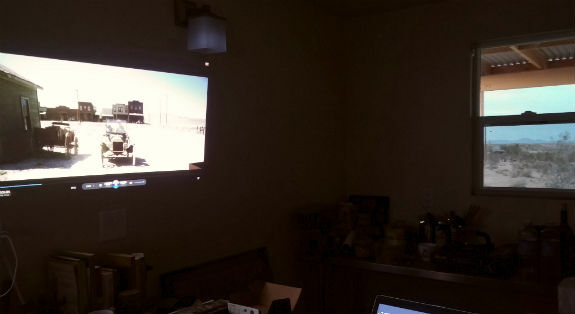 We haven't bought a TV for either location but last week I jury rigged my PC, an external CD drive and a small portable projector to screen a movie on the wall. It was wonderful. Showing is Paul Thomas Anderson's There Will Be Blood, about oil prospecting and damaged human relationships around 1911. This was so much better than a wide screen television, and when I turn it off there's nothing hanging around on the wall taking up space. Solutions like this remind me of the old saying, "Use it up, wear it out, make it do or do without." Where that statement used to seem tea-stained with morality, it now sounds purely practical. Hi Teresa, Happy New Year. Would love to get purchasing advice on your small portable projector and cable attachment to your apple? laptop. I ended up watching Antonioni's Red Desert on my lap top all the time thinking it would have been much cooler to project... Hope to see you again next time I am out! Sounds like a tough experience, but love your positive attitude towards everything. I'm glad you're making do with what you can get, I'll also remember this saying from now on, very motivational!